We've packaged together 3 premium day tours to 3 of Cairns most popular attractions. No visit to Cairns is complete without doing the Kuranda Skyrail & Scenic Train. We'll show you both Green Island and the Outer Great Barrier Reef, with a semi-sub ride included and all the snorkelling you like. Finally you'll get to explore the World Heritage Listed Daintree Rainforest with a visit to Cape Tribulation, including Mossman Gorge and Port Douglas! Additional Costs:$6.50pp for EMC (reef tax) applies to the reef trip. Transfers , if needed are extra for the reef day. All other transfers included. Children = 4 - 11 & 12 - 14 years, Infant = 0 - 3 years, Family = 2 adults and 2 children aged 4 - 12. Your day starts with a coach transfer from your accommodation to Freshwater Train Station, where you'll board the Kuranda Scenic Railway. The train takes approximately one and a half hours to wind it's way through the rainforest to Kuranda. In Kuranda Village you'll have ample time to see the sights or visit the world famous Kuranda Markets. You'll return to Cairns via the spectacular Skyrail Cablecar. This is the preferred direction of travel. A coach will then transfer you back to your accommodation. Coach transfers are not included in this day as most Cairns accommodation is close to the Marina, but they can be arranged if you like. Cape Tribulation is located in the heart of the Daintree National Park World Heritage Area, which contains the oldest continually surviving tropical rainforests in the world. Estimated to be over 100 million years old, the Wet Tropics area is home to around 50% of Australia's plant and animal species with many species found nowhere else in the world. 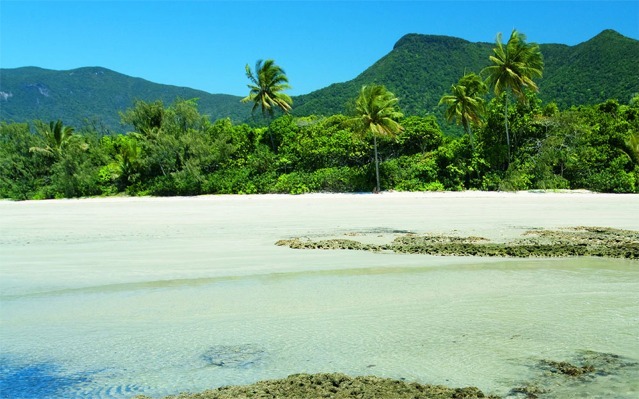 8.30am-9.15am: Port Douglas option - Take in the spectacular scenic coastal drive north of Cairns, before you enjoy free time in Port Douglas to soak up the village atmosphere along with a brief tour of 4 mile beach. 8.30am - 9.15am: Wildlife Habitat Option - Enjoy a guided tour of the World Famous Wildlife Habitat featuring all your favourite Aussie Animals including free ranging Kangaroos and Wallabys. 12.30pm - 1.15pm: Lunch Time - You can bring your own lunch or choose to include it in your package. Like this tour but not the package - Click here to book this tour by itself.